This is what one corner of my kitchen looked like a few weeks ago when I was deep into the baking of a cake. 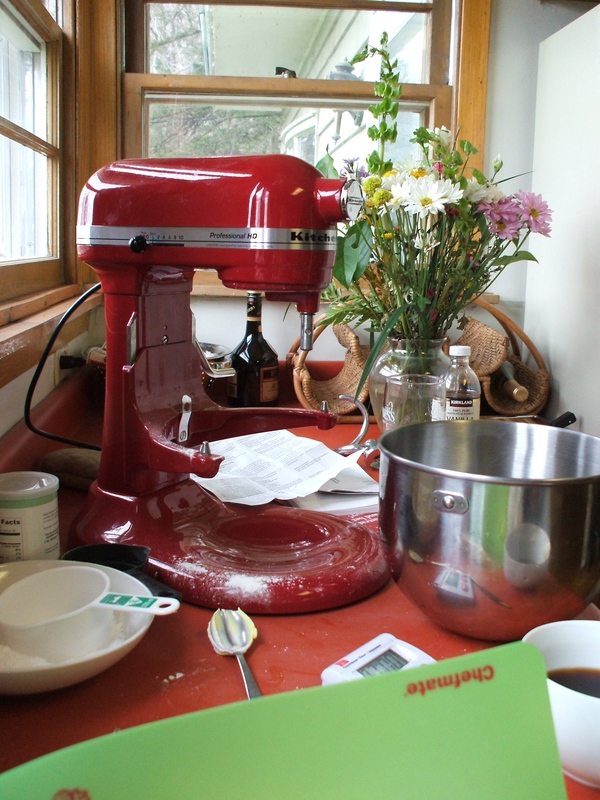 You can see my trusty mixer dusted with flour, measuring cups, meringue powder, some vanilla in the background, dishes, and of course a cup of black coffee to keep me going. The kitchen was a mess and my disorganization made the job a little harder as frosting would overcook while I searched for a tool or an ingredient would be forgotten in my haste. I vowed to be a more organized and neat baker after that. Having all of your ingredients at the ready is especially important when cooking dishes like stir fry which can require quick action and a lot of prepared ingredients. Prepare Tofu: Spread flour into shallow dish. Whisk egg in separate shallow dish. Pat tofu dry with paper towels and season with salt and pepper. Dredge tofu, one piece at a time, in flour to coat and shake of excess. 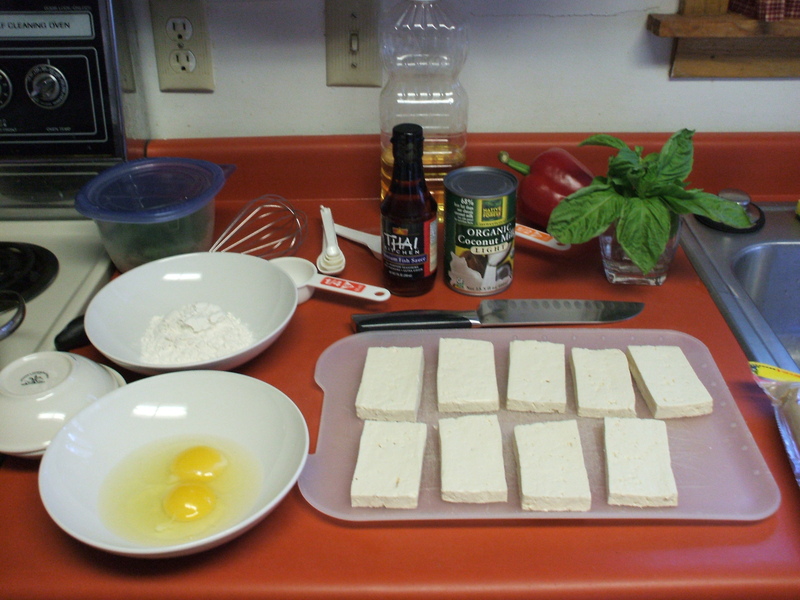 Coat and Cook Tofu: Heat 2 tablespoons of oil in a 12-inch nonstick skillet over medium-high heat until just smoking. Dip floured tofu in egg, allowing excess to drip off, then add to skillet. Brown tofu well on both sides, about 6 minutes total. Transfer tofu to plate and set aside. Make Sauce: Add remaining tablespoon oil and curry paste to oil left in skillet and cook over medium-hot heat until fragrant, about 1 minute. Whisk in coconut milk, fish sauce, and brown sugar and simmer until thickened, about 5 minutes. Simmer Vegetables: Stir in bell pepper and peas and simmer until vegetables are crisp-tender, about 5 minutes. Add Tofu and Finish: Off heat, stir in basil and season with salt and pepper to taste. Nestle tofu into sauce and serve.